Fine words but words dripping with hypocrisy. 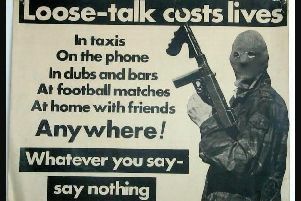 There were many examples of the IRA engaging in similar activity... I think of Mary Travers, the 22-year-old school teacher shot as she left mass in 1984. I remember Patrick Kerr, the off-duty prison officer shot leaving mass in St Patrick’s Cathedral Armagh in 1985 in front of this young children. I recall Hugh McCormac, an off duty RUC sergeant shot at point blank range as he arrived for mass outside Enniskillen also in 1985. Again children witnessed their father die at the hands of the PIRA. Norman Duddy was shot in front of his family as he arrived for worship in Londonderry in 1982. We should not forget the shocking murder of Michael Cassidy, the off-duty prison officer shot as he left his sister’s wedding in Clogher chapel in 1979 as he held his three year old daughter’s hand. And there are many other examples of Republican contempt for places of worship and worshipers. Perhaps the most memorable is the attack on Darkley mission hall in 1983 and the bombing of Enniskillen’s Remembrance Service in 1987. There should indeed, as McDonald says, be no place for the kind of hatred we saw in New Zealand in the world. The truth, however, is that Republicans visited plenty of it on the people of Northern Ireland.